To say that Benimar has made a real impact on the UK motorhome market since its reappearance on these shores in 2014 would be an understatement. The Spanish brand’s coachbuilt Mileo range, exclusively available via Marquis Leisure, has gone on to account for five per cent of the new motorhome market! No mean feat when buyers can browse from a seemingly bewildering choice of models from an extensive range of manufacturers. So why has Benimar become such a trusty touring amigo for motorcaravanners in the UK? First, Marquis Leisure has been very canny in the way that it put Benimar back in Blighty. The Spanish producer agreed to re-hand Mileo models for the UK market, so the habitation door is on the nearside, like domestically produced coachbuilt motorhomes. Secondly, Marquis upspecced the baseline Benimar offering. Engines came in 150bhp tune, and desirable extras including DAB radios with USB and Bluetooth device connectivity were included in the price, along with sat-nav and colour reversing cameras. So there’s no need to look for options packs to boost the spec, because there aren’t any. The few extras that you can choose cover chassis and base vehicle upgrades, habitation air-con and faux leather upholstery. This kind of clarity is a salesman’s dream: “This is what you get, and this is the price you pay”. Little wonder these imports from sunny Castellón have been positively flying off Marquis Leisure’s 11 forecourts. We’ve tested several Benimar Mileo models since 2014. Some carry floorplans that seem quite quirky to UK tastes, but the six-berth 313 is a more straightforward proposition. With a double bed over the cab and a pair of transverse rear bunks bookending a full dinette, it’s designed for families of four to six. All quite straightforward so far, but the 313 has another ace up its sleeve: it’s a ferry-friendly 5.99m long. 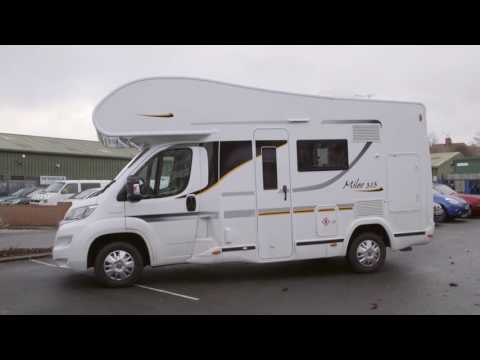 To find out how well the Benimar Mileo 313 performs as a family motorhome, we ran one as a long-term test vehicle, taking it to the Scottish Highlands and south-west England, among other destinations. Many leading motorhome brands have moved away from the overcab coachbuilt body style, in favour of low-profile models carrying drop-down beds. But there has been a mini-revival of overcabs during the past couple of seasons, with imported marques Adria and Pilote releasing new models to target rental fleets. The Benimar Mileo range features three overcab coachbuilts, but the 313 is the smallest and offers a compelling blend of compactness and manoeuvrability. In fact, the pronounced, but very well integrated, overcab on such a short body length makes for a neat and tidy-looking vehicle, one that appears smaller than it really is. And this is the over-riding impression upon entering the 313 for the first time, namely that its designers have managed to fit a lot in just short of six metres. Benimar’s interior styling showcases its Continental origins. It’s a contemporary ensemble, with high-contrast cabinetwork that pairs a dark wood finish with lighter-coloured locker facings, in turn set off against beige soft furnishings with chocolate infills and red scatter cushions. The balance of light and dark tilts towards the former. Together with the pine-toned vinyl floor covering, the interior space feels bright and airy. All Benimar Mileo motorhomes ride on the Fiat Ducato, with 2.3-litre 150bhp turbodiesel engines as standard. With a MiRO of 3000kg, the 313 is therefore a lively drive, with plenty of power available. The Ducato cab offers a commanding driving position, although some of our testers were of a shorter persuasion and found that the handbrake, located to the right of the driver’s seat, had a long drop. The controls don’t need heavy touches or inputs, so the Ducato is not tiring on long drives. The precise steering makes it easy to put the ’van just where you want it on the road. In addition, the lack of a heavy bed mechanism mounted high up, as would be the case with a drop-down bed, means that there’s no excessive leaning into corners. Our testers regularly comment on the width of the Fiat Ducato’s A-pillars – because they’re quite chunky, one needs to take extra care when approaching junctions. Similarly, when driving the Benimar Mileo 313 solo, there’s no window just behind the passenger seat, so it’s best to negotiate a Y-shaped junction with as much of a right-angled approach as possible, for a better view. Manoeuvring at slow speeds is made even easier thanks to the inclusion of a colour reversing camera. On an 1100-mile return trip to the Scottish Highlands, our testers reported a fuel economy figure of 22.3mpg. Four rear travel seats are provided, on the facing dinette sofas. Centrally located, on the offside of the vehicle, the dinette is the beating heart of the Benimar Mileo 313. Our test team felt that the dinette benches offered good support, but that legroom was a tad limited. A white table clips to the sidewall under the large side window, and has an extending section to bring other loungers or diners into play when required. Facing into the kitchen, the dinette is a sociable space, but the beauty of this floorplan means it doesn’t have to be cramped. With the overcab compartment also available, plus the rear bunks, children can make dens elsewhere, leaving the adults to enjoy the dinette area. And with a dedicated place for a TV – on top of the nearside wardrobe – one can continue relaxing after the children have turned in. Natural light floods in through the side window, and from a large Heki above the lounge. Illumination comes via a ceiling-mounted LED, with an LED strip on the underside of the overhead lockers in support. With so much to squeeze into a six-metre body length, space for the kitchen is in a short supply in the Benimar Mileo 313. Having said that, organised cooks will be able to make the most of what’s available to them. A three-burner cooker (two gas burners and an electric hot plate) sits to the right of the kitchen unit, next to a round sink. With the respective covers in place, there’s enough room for slicing and dicing. The dinette table is close at hand, to provide a useful surface for resting items before they’re required by pan or oven. In that department, the 313 is serviced by a combination oven and grill – perhaps not quite up to the task of cooking a Sunday roast for six. The other kitchen equipment includes a microwave oven, mounted above a large fridge with separate freezer. Our testers felt that the kitchen worked well, but would have appreciated the microwave oven being mounted lower for easier access when handling hot items. With a floorplan prioritising multiple places to sleep, the six-berth Benimar Mileo 313 should perform well in this particular category. You can choose between a pair of doubles at the front of the ’van, and two single bunks at the rear. The overcab’s transverse double bed offers the largest sleeping space, at 2.06 x 1.55m (6ft 8in x 5ft 1in), with the lounge double coming in slightly smaller, at 1.7 x 1.3m (5ft 6in x 4ft 3in). The rear bunks measure 2.1 x 0.8m (6ft 9in x 2ft 6in) and 2.1 x 0.62m (6ft 9in x 2ft). Our adult testers found the fixed beds to be most comfortable, although the overcab double is accessed via a six-rung aluminium ladder. Our junior testers had no complaints with the bunk beds, bar deciding who was going to get the top one. Making up the lounge bed is simple once you’ve memorised the steps: the table drops, the seat benches are extended and two filler cushions added. At well under 6ft long, though, this double may suit teens better than adults. One of the Benimar Mileo 313’s designers clearly decided to deviate from the ‘compact’ brief when drawing up plans for the washroom. Although tucked between the dinette and the rear bunks, it manages to feel much bigger than it really is, by sharing some common features. Enter through the cream-coloured sliding door and you’ll find yourself standing in the shower compartment, immediately in front of the vanity unit. Many a space-saving motorhome washroom has a shower head that doubles as a mixer tap, and this is the case in the 313. In a similar vein, the washroom floor is also the shower tray, and this area is partitioned from the rest of the space by a cylindrical screen. To the right you’ll find a swivelling cassette toilet. The vanity unit itself offers a half-length mirror, arranged in an L-shape, while a window to the right provides natural illumination. Again, the use of colour-contrasting surfaces gives a clean, contemporary look, while the large expanse of mirror boosts the feeling of space. Our testers felt the Mileo 313’s washroom to be a real achievement, given the space available. The sink is of a reasonable size, and other practical touches include a cupboard over the side window, plus a handy recess next to the toilet. Although these facilities allow occupants of the 313 to be self-sufficient, in reality they will most likely find themselves staying on full-facility sites, where showering won’t require parties of four or more to frequently refill the motorhome’s 120-litre fresh-water tank. The Benimar Mileo 313 has a user payload of 500kg as standard. This can be distributed all around the vehicle, with five overhead lockers, a full-length wardrobe and assorted cupboards and recesses available. Bunk beds across the rear mean that you can’t have conventional garage storage, but Benimar has come up with a good workaround. The lower bunk can be raised up out of the way to reveal a large compartment. This is big enough to carry some of the bulkier items one may need on tour – these can be loaded via waist-height hatches on either side of the vehicle. Some may appreciate a little more payload for any specialist leisure kit. A free chassis upgrade to 3650kg is available for drivers with C1 entitlement on their driving licence. This increases the total user payload to 650kg. For its £47,495 ticket price (this is the price for 2017 models), the Benimar Mileo 313 has a generous specification as standard. A 140W solar panel and omnidirectional TV aerial are included, as is a spare wheel. Inside, steering wheel-mounted audio and smartphone controls feature, alongside concertina blinds for the cab windows. Truma’s Combi system provides space- and water-heating, with ducted blown-air piped around the vehicle (during mid-winter testing, this warmed the 313 up quickly while registering non-excessive noise levels). Benimar Mileo models come with a Winter Pack as standard. This comprises an upgrade of the Truma Combi heating to 6kW, insulated and heated waste tanks, insulated external pipes, an external thermal screen cover and external fridge vent covers. Refinements and enhancements to the Benimar Mileo range for the 2017 season include the new 2.3-litre, 150bhp turbodiesel Euro 6-compliant engine, ESP, traction control and hill assist. You also get 16in black alloy wheels, LED daytime running lights, a rear bumper with LED lights, chrome inserts in the rear light cluster, and a leather-wrapped steering wheel and gear knob. Inside for 2017, there are now new positive catches to all furniture doors and soft-closing hinges for the curved locker doors. Plus, low-energy LED lighting, an LED awning light and a new Thetford toilet are fitted. Benimar’s Mileo 313 was a deserving winner of the best family ’van category in our Motorhome of the Year awards 2016. Groups of four or more will warm to its clever use of space. In addition, the sub-6m body length means it’s easy to pilot, park and pitch, as well as take overseas on ferries. Some would say that overcab coachbuilts have gone out of fashion, but a compact example like this has a lot going for it. Its short body gives it an appealing look, and that double bed and bunks are always ready to be used – ideal after a long slog to your campsite. With a habitation area switched for the UK, a high standard spec including Fiat’s 150bhp engine and family-friendly 500kg user payload for £47,495, the Benimar Mileo 313 sounds like a bargain to us. And to see other Benimar motorhomes for sale, click here.